HDD rig specifications from TT Technologies, Ditch Witch, Central Mine Equipment, Vermeer, American Augers, Barbco, Astec Underground and Universal HDD. Plastic pipe offerings from McElroy, Georg Fischer Piping Systems, Ritmo America, Footage Tools, Q-TEK and IPEX Inc.
Descriptions on polymer drilling fluids currently offered, including products from Baroid Industrial Drilling Products, Century Products, CETCO Drilling Products, I.E.S. Drilling Supply, INROCK/Drillers Supply, Kem-Tron, M-I SWACO, Polymer Drilling Systems and Wyo-Ben. An up-to-date list of the bentonite drilling fluids currently offered, including products from Baroid Industrial Drilling Products, Century Products, CETCO Drilling Products, I.E.S. Drilling Supply, INROCK/Drillers Supply, M-I SWACO, Polymer Drilling Systems and Wyo-Ben. Wireline tracking technology from INROCK, Underground Tools Inc., Sharewell and Horizontal Technology. Details on walkover locators from Radiodetection/SPX Corp., Digital Control Inc. and Ditch Witch. The Northeast Trenchless Association will be hosting its Annual Training and Development Seminar on January 17 -19, 2011 at the Crowne Plaza Boston North Shore in Danvers, Ma. The meeting is open to members and non-members and will include a multi-track conference session. President Obama has selected Vermeer CEO Mary Andringa as a private-sector representative for business, industry, agriculture and labor on the President’s Export Council (PEC). The PEC is the principal national advisory committee on international trade. Godwin Pumps Mourns Loss of Joseph Abbott, Jr.
Joseph L. Abbott, Jr., national sales manager for Godwin Pumps, passed away on Sept. 12. If you are looking for how cutting-edge trenchless technology is being used in innovative ways, the Sixth Annual Western Regional No-Dig Conference & Exhibition to be held in Tempe, AZ, will present several discussions on that subject. The Plastics Pipe Institute (PPI) has completed its analysis on the potential effects of disinfectants on potable water supply polyethylene (PE) pipe. The findings are available at http://www.janalab.com/pdf/disinfection.pdf. Louis Keller, 87, of Edgeley, ND, died July 11. Keller and his brother, Cyril, invented the skid-steer loader, which in 1958 was bought by the Melroe Manufacturing Co., Gwinner, ND, which would later become the Bobcat Co. More than 750,000 Bobcat skid-steer loaders have been produced. Perma‐Liner Industries has developed a proven method to rehabilitate small diameter pipelines utilizing a “local” sectional repair system. WinCan v8 transforms raw data into the intelligence you need to make maintenance decisions. Its intuitive interface grants easy access to information while enforcing consistent data entry. The self-propelled, robust LAMP II with fiberglass push cable is designed to perform pan and tilt inspections of the mainline sewer pipe while viewing and inspecting a lateral pipe. An affordable alternative to a combination sewer cleaning unit, Super Products’ new Camel Jet 1600 is a truck-mounted, high-pressure water jetting system. Centri-pipe creates a new, structurally sound concrete pipe inside the old one. This new pipe is 100 percent environmentally sound, waterproof, and fully sealed from end to end. The new Siemens Siwa LeakControl location and monitoring system, not only continuously checks for leaks in water pipes, but also pinpoints them automatically. With its fast and simple installation in 15 minutes or less, the Easy Riser manhole systems made of 100 percent recycled tires, prevents storm water infiltration, absorbs vehicle impact to protect the structure, leads to a smooth road surface and is competitively priced to steel lid risers. Gorman-Rupp announces the new 3-inch diesel engine driven pump. AlturnaMats’ new line of 100 percent polyethylene outrigger pads are available in 1-inch thick sizes ranging from 15 inch by 15 inch to 48 inch by 48 inch. The Type 514-519 High Flow Diaphragm Valve Series features an optimized, turbulence-free flow geometry that offers significantly increased flow rate performance and lower energy consumption. John Deere has added an Interim Tier 4 (IT4) engine option for its 744K 4WD loader. The John Deere PowerTech 9.0-L IT4 diesel engine uses cooled exhaust gas recirculation technology to meet emissions regulations while producing 304 hp. SaniTite HP, a new polypropylene sewer pipe from Advanced Drainage Systems (ADS), which meets ASTM F-2736 and F-2764, was recently used in a municipal project in the Kentucky heartland. A $7 billion project labor agreement (PLA) was signed September 14 between the United Association and TransCanada Corporation to begin construction on the Keystone Gulf Coast Expansion Pipeline (Keystone XL). In a time when the contruction industry is facing record unemployment, this project is expected to create thousands of jobs for the members of labor organizations. Recent business news from Driver Pipeline, Super Products, ISCO Industries, Thompson Pump & Mfg., Inspar Robotic Technologies, Akkerman, Caterpillar, Sheehan Pipe Line Construction Co., ITT, Canberra Pumps, Geospatial Holdings, Interplastic, iRENTequip, Reed Manufacturing and JCB. Advertisers from the print edition of <em>Underground Construction</em>, September 2010, Volume 65 No. 9. Staking University announces the release of its utility locator training video Locating Unlimited. This 113-minute video focuses on two concepts: how locating instruments work and how to operate locating instruments. By covering those two concepts, without dependence on a particular brand of equipment, the video is a timeless resource of information about locating pipes and cables. The Small Business Jobs and Credit Act passed by the U.S. Senate Sept. 16 will extend the 50 percent bonus depreciation deduction for 2010. Additionally, it includes approximately $12 billion in tax relief for small businesses and a $30 billion lending fund that will be administered by the Treasury Department. The energy bill the Senate is to finally take up in September is primarily a "BP-response" bill. It contains none of the greenhouse gas emission reductions that Democrats had hoped to bring to a vote in a "Climate Change" bill, which is dead for this year. The Clean Energy Jobs and Oil Company Accountability Act of 2010 focuses mostly on oil spill liability and response issues. In 2009, integrated systems manufacturer Kem-Tron Technologies barely broke even. Despite a market that’s flat in more ways than one, the company’s president says that as of September 2010 the company’s revenue has already matched the full year totals for 2009, with 30% growth expected by the end of the year. What made the difference? New COO named at Inland Pipe Rehabilitation; RS Technik hires technical director; Corrpro receives contract for cathodic protection; RIDGIDConnect Sweepstakes winner announced; Insituform awarded contracts, opens Singapore office. I read recently where more government agencies have rationalized getting involved in determining transmission energy pipeline routes. Apparently, there is a perception that pipelines often go through more impoverished areas and in today’s politically-correct charged culture, that just cannot be allowed to happen without further investigation and, of course, construction delays. After all, this is the 21st century where private business is under siege. Why should pipeline construction be any different? For a dozen years, Municipal Forums sponsored by the Trenchless Technology Center (TTC) at Louisiana Tech University have been bringing vital information about the various trenchless technologies to municipal and public works officials. The forums are also attended by consultants, contractors, suppliers and other interested parties. The Center for Innovative Grouting Materials and Technology (CIGMAT) Research Center was established in 1994 at the University of Houston, Houston TX. CIGMAT’s goals are to foster improved understanding of grouting and coating materials under various applications. Also of interest are other competing and complementary materials and technologies to grouting and coatings used in the construction and rehabilitation of civil infrastructure and offshore pipelines. 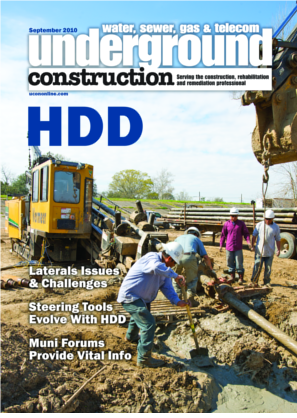 For horizontal directional drilling, the first “D” in the acronym HDD is the key to the success of this versatile trenchless technology -- without the directional capability, HDD could never have achieved the impact in utility construction that it has over the last 20-plus years. Failing sanitary sewer systems are confronting American cities of all sizes. Many systems are operating beyond capacity and old underground infrastructure is crumbling with infiltration causing overflows following heavy rains and leaking sewage contaminating groundwater. Many systems are operating under U.S. Environmental Protection Agency consent decrees in which customers ultimately pay for correcting serious deficiencies. Europe, like the United States, is struggling to upgrade its infrastructure. In Poland, for example, over 1,000 wastewater treatment plants need to be constructed or upgraded in order to meet European standards which take effect in 2015. Warsaw, the capital and largest city in Poland, has many planned upgrades, including a recent two-year-long project which will provide added capacity and decrease overflows.